I don’t see my sister as much as we both would like, but this week, we planned a date! When the opportunity presented itself to have her over for dinner, I immediately knew what I wanted to make – Zucchini gratin. We have huge zucchinis at home from Bob’s mom, and sometimes when I make toast in the morning, I feel like they’re looking at me. They’ve been neglected. Unfortunately, my dream of creamy gratin browning in my new Staub pot will have to wait. I forgot Sarah hates zucchini. She would be a good sport and say she doesn’t, but she really does. With this in mind, I set about making a backup plan. Sarah and I both have a soft spot for pasta, but I wanted to do something a little different. I found a risotto recipe that caught my eye, and knew this would be a satisfying alternative. 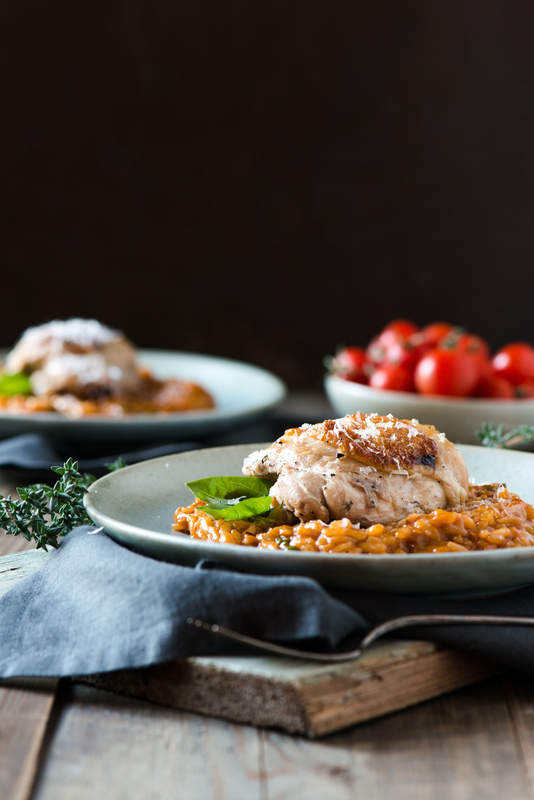 Bon Appétit’s recipe for white wine braised chicken would be the perfect complement! 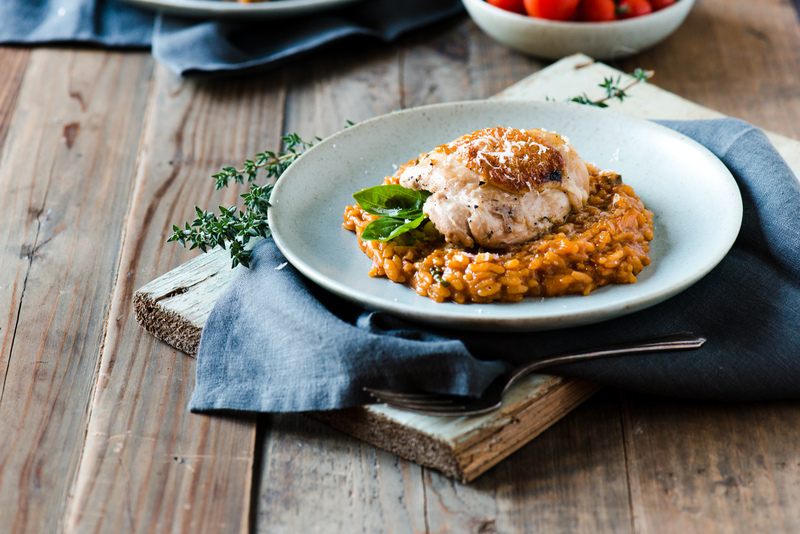 Freshly picked tomatoes make the perfect base for a creamy roasted tomato risotto and moist, braised chicken thighs. Spread sliced tomatoes on a baking sheet, drizzle with oil, lightly mixing around to spread oil, sprinkle with thyme, and generously season with salt & pepper. Roast at 350F for about an hour. Once roasted, allow to cool for about 15 minutes, then puree tomatoes. Roasted tomato puree can be made a day or two in advance, if desired. In a dutch oven, or heavy lidded pot, heat oil over medium-high heat. Season chicken with salt & pepper and cook until golden brown, about 5 minutes per side. Transfer to a plate. Add shallots and garlic to the pot, cooking about 2 minutes. Add thyme and white wine, bring to a boil, reduce heat, and simmer until reduced by ⅔, about 4 minutes. Add chicken back to pot, skin side up. Add brought, bring to a simmer, cover and transfer to the oven. Braise until chicken is cooked through, 20-25 minutes. Uncover, continuing to cook about 8-10 minutes until skin crisps up. In a large pan on medium heat, add olive oil. Once warmed, add onions, sweating for about 5 minutes until softened and slightly translucent. Add rice to pan, stirring to mix with onions and oil, allowing to toast for about 5 minutes. Add the white wine, stirring until wine becomes absorbed by rice, then add tomato puree and garlic, continue to stir for 1-2 minutes. Begin adding stuck, about a ½ cup at a time, stirring continuously until absorbed, before adding more stock. 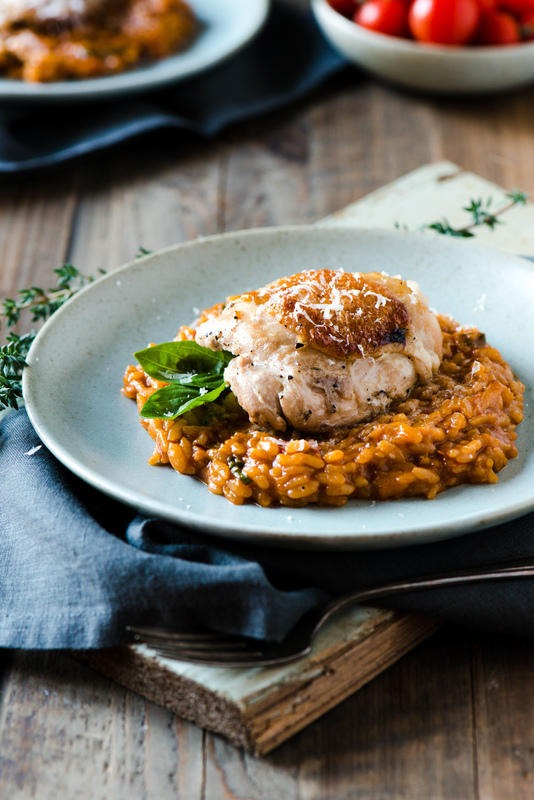 Continue adding more stock until risotto is creamy, and rice is cooked al dente (the risotto should be creamy enough, that it will slowly spread out when spooned onto a plate). Mix in basil, and season to taste with salt & pepper. Spoon risotto on to plate, placing 2 chicken thighs on top of risotto, and grating a generous amount of parmesan onto the dish. Recipes adapted from Bon Appetit and Drizzle and Dip. Truth be told, I may have picked both of these recipes because of wine. I love it. I want wine with dinner, wine in dinner, wine baths, wine minimizing pore cleanser… (Is that a thing? It should be.) Wine is good for the soul. So is family. I was delighted to have my sister over, and to use my Staub pot (a house-warming gift from grandpa). He couldn’t have chosen a more fitting present, both for Bob and I, but we hadn’t used it until now. How perfect! Bob popped the tomatoes into the oven to roast and get our recipes going, but aside from that he let my fly solo with this recipe. I really enjoy cooking and tag teaming, but it was kind of fun to see my vision for dinner come together too! Bob busied himself setting up a quick backdrop for a photo before we settled in for dinner. It turned out beautifully, and it was a treat to have my sister over! Perhaps you can enjoy these recipes with your loved ones too. Enjoy!